In the last article, you have learned how to convert a Java object to JSON String and in today's article, you will learn the opposite, i.e. converting a JSON String to Java object. The first example was known as JSON serialization example and this one is known as JSON deserialization because we are creating a Java object from a String. The idea is very similar to classical Serialization in Java where you convert a Java object to another binary format which can be transported over the network or can be saved in the disk for further usage. That's why the process of converting a Java object to JSON is known as serialization and converting a JSON document to Java object is known as De-Serialization. You can use any JSON library to perform serialization and de-serialization e.g. Jackson Databind, Gson, or Json-simple. In this program, I'll show you how to use Gson to create a Java object from given JSON String. While using JSON String in Java code, there is a littlie problem. Since JSON String are enclosed with double quotes, they need to be escaped in Java code e.g. every double quotes i.e. " needs to write as \". This can be a big problem if your JSON String is more than a couple of values, thankfully there are a couple of ways to solve this problem. You can see this tutorial to learn more about how to enable escape String setting in Eclipse and how to automatically escape JSON String in Java. You can see here we don't need to escape any String inside JSON, which makes it more readable. Here are the basic steps to convert a JSON String to Java using Google's Gson library. Basically, you give a JSON document to Gson and it will return a Java object, whose field is populated using values given in JSON String. Since Gson doesn't know which class of object given JSON needs to be converted, you also need to tell him the class name. 1) Download Gson library and add JAR into the classpath, if you are using Maven just add the dependency in your pom.xml file. 2) Create the String you want to convert into a Java object. 3) Create the object of Gson class, a helper class to convert a JSON String to a java object. 4) Call the Gson.fromJSon(json, UserDetails.class) to convert the given JSON String to object of the class given as the second argument. This method returns a Java object whose fields are populated using values given in JSON String. * Java Program to convert JSON String to Java Object using Gson. You can see how we have to pass the class of the expected Java object as the second parameter. Otherwise, Gson doesn't know which object it needs to map given JSON String. When you print the user object you can see that it contains the values from the provided JSON String. You can also see those values in the debugger if you are using Eclipse for debugging as shown in the following screenshot. Similar to the last example, if you are using Maven then you can use following dependency to download Gson.jar file automatically. Alternatively, you can manually download Gson.jar from Maven Central library and put it on your application's classpath. If you have trouble running a program in Eclipse, see here, or, if you are running the program from the command line then you can follow steps given here to add any external JAR to the classpath. That's all about how to convert a JSON String to Java object using Gson library. It is very simple, you just need to use the fromJson() method of Gson class and you are done. 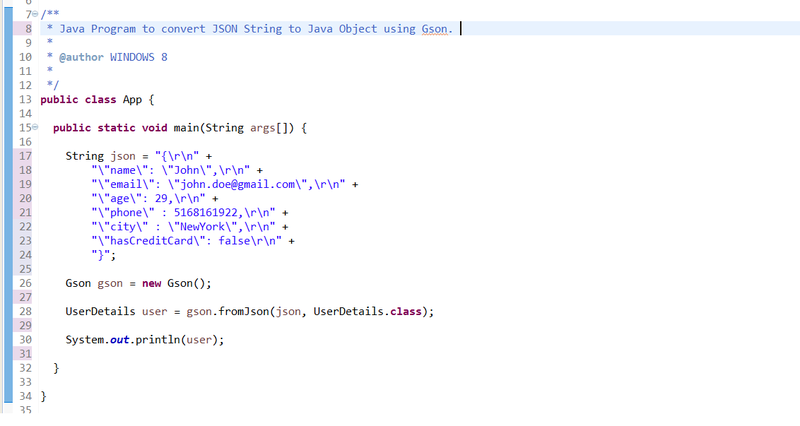 This is the simplest way to convert a JSON String in Java, I don't think it can get any simpler than this. You just need to include the Gson.jar file in your application's classpath or even better just use Maven or Gradle to manage dependencies and get rid of manual downloading JAR and adding into classpath stuff. Thanks for reading this article. If you like this article then please share with your friends and colleagues, if you have any questions or feedback then please drop a comment. P.S. 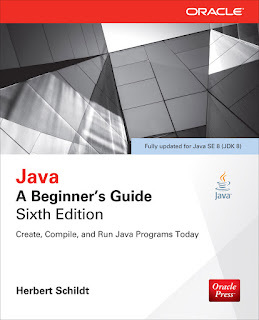 - If you want to learn more about the advanced topic in Java, I also suggest you reading "Core Java Volume 2 - Advanced Features" By Cay S. Horstmann, it covers several advanced Java features e.g. JAXB, JDBC etc. 1A very nice article indeed. I have only one question. what if the json has a date parameter with COLONS in it? how would it convert into java object by escaping colons?